Σχεδιασμένο για ταξίδια τόσο επαγγελματικά όσο και διασκέδασης, το Sayura Beach Hotel είναι ιδανικά τοποθετημένο στη Θάλπε, μια από τις διασημότερες περιοχές της πόλης. Από εδώ, οι επισκέπτες μπορούν να έχουν άμεση πρόσβαση σε όλα όσα η πόλη έχει να προσφέρει. Με την βολική του τοποθεσία, το ξενοδοχείο προσφέρει εύκολη πρόσβαση στους προορισμούς της πόλης που πρέπει οπωσδήποτε να δείτε. Στο Sayura Beach Hotel, η άψογη εξυπηρέτηση και οι ανώτερες εγκαταστάσεις συντελούν ώστε η διαμονή εκεί να σας μείνει αξέχαστη. Κορυφαία χαρακτηριστικά του ξενοδοχείου συμπεριλαμβάνουν τα δωρεάν WiFi σε όλα τα δωμάτια, 24ωρη φύλαξη, ημερήσιος καθαρισμός, τζάκι, ταχυδρομική υπηρεσία. Οι πελάτες μπορούν να επιλέξουν από 21 δωμάτια καθώς όλα διαθέτουν μια ατμόσφαιρα απόλυτης αρμονίας και γαλήνης. Το ξενοδοχείο προσφέρει μια άριστη ποικιλία ψυχαγωγικών εγκαταστάσεων, όπως τα σνόρκελινγκ, ιδιωτική παραλία, εσωτερική πισίνα, καταδύσεις, ψάρεμα. Το Sayura Beach Hotel είναι μια έξυπνη επιλογή για τους ταξιδιώτες στη Ουναβατούνα προσφέροντας κάθε φορά μια ήρεμη και ήσυχη διαμονή. Great location directly on the beach and the rooms are clean and spacious. Ok breakfast with great views of the ocean. We checked in for a 2 nights on 20th Dec. and left first thing in the morning the next day before breakfast disgusted with the place. Upon arrival there was a certain foul odor wafting in the air ... The A/c in our room (Room 32) was only working 50/50 and was full of mold spores. Of course, the Wifi also didn't work ... ! The smell of sewage in the bathroom was overpowering... coming from the drain of the shower stall cubicle. My girlfriend and I were lounging on the sun beds watching the sunset, when a SEWAGE SMELL overpowered us again. I felt something cool on my foot, looked down, and noticed a foul-smelling water bubbling up from under my sunbed, through the sand. Upon questioning the duty manager, he confirmed that the hotel had indeed buried sewage tanks/waste tanks of some sort under the beach in front of the hotel and that they were currently overflowing due to the hotel being at full capacity!! Gross! DO NOT STAY HERE!! Sayura was a great find. The beachfront is lovely. Turtles swimming all day, every day, right in front of the hotel. A nice beach with some local dining options. Our room had a great view and we enjoyed the kindness of the staff. Thank you. Nice chill out place right on the beach- waves crush right into your room! Secluded bay, can swimm, turtles around, but be carefull, it's an open ocean! For food, you'll have to go elsewhere. Plenty of options nearby. Turtles from the balcony. Crowded beach, but sunbeds. Breakfast on average needs. Family ressort. We stayed at Sayura Beach Hotel from 19th to 21st March 2018. The place was very good, the view from the room was fantastic. You basically wake up with sound and view of the sea. Buffet breakfast was simple but delicious. Location was good and 15 minutes to Galle. Staff was friendly and very helpful. They should improve on their driver's accommodation. Other than that all are good. Loved our room on the 5th floor overlooking the beach where we could watch the turtles swimming in the sea. Our room was very clean and the staff were always friendly and helpful. Breakfast and dinner at the restaurant were yummy. Only a short tuk tuk ride away from all the bars/restaurants on the beach. Would definitely stay at this hotel again. the balcony has transparent sheets. also the hotel is very close to the sea. Therefore there is an excellent view of the sea from the balcony. Enjoyable stay but the reception staff need additional training. Sayura Beach hotel is right on the beach with a outdoor/indoor pool in one. 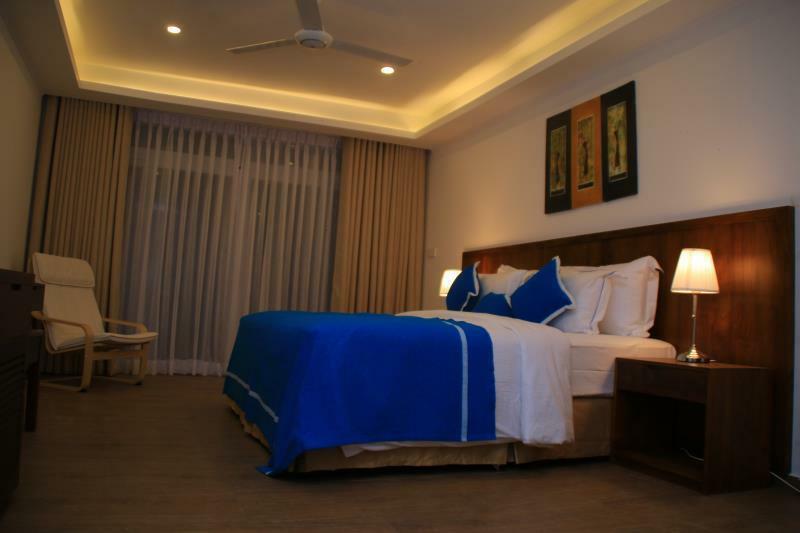 The rooms are big and comfortable with modern furnishings. The staff is very helpful and hardworking except for one waitress during breakfast. The beach in front is not kid/swim friendly due to large rocks and coral but just a few steps away has a nice area to swim. The view is gorgeous from the rooms with incredible sunsets. The AC, TV and wifi are good. The wifi got iffy once in a while but when it works, it's super fast. The AC is big and powerful, the only bad thing is that every time you open the balcony door it would shut off due to the sensor. There's plenty of other hotels and restaurants on the path so there's many choices for meals. We ate at the hotel 2 nights out of 3 and the food is pretty good with fast service. A bit pricey but not outrageous compared to the other restaurants in the area but convenient since we just had to go downstairs. The breakfast was average. We ate at 8:30 and 9am so not too late but the food would be cold and low. But upon request they made new eggs etc. The fruit sat out a bit too long for my liking with flies but other dishes were covered. My only complaint was that my room was directly in front of the stairs so it was loud during breakfast with the clanging dishes since all the bathrooms have OPENED windows. I also requested that both our rooms be next to each other and quiet rooms 2 months prior to arrival which was not provided but the management gave us an upgrade the first night and a 10% discount for the inconvenience. Overall it was good. We were so excited to find this hotel after traveling for 10 days around Sri Lanka. Brand new hotel right on beachfront. 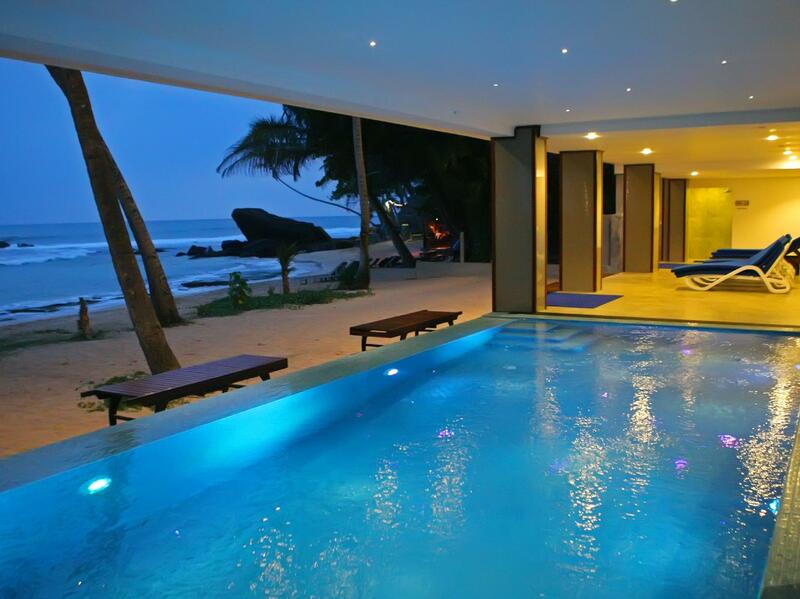 Beachfront location is superb in small town of Unawatuna. 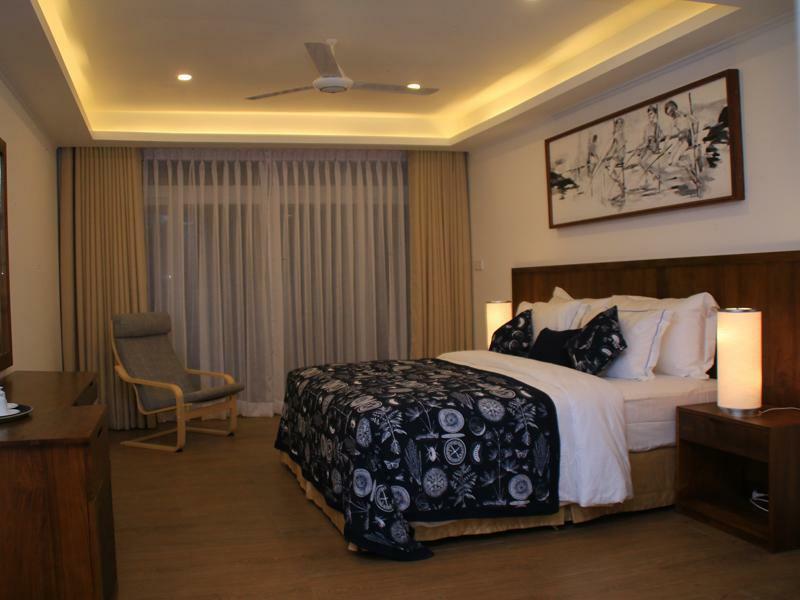 Beautiful comfortable rooms and beds. Lovely balcony looking over the ocean. 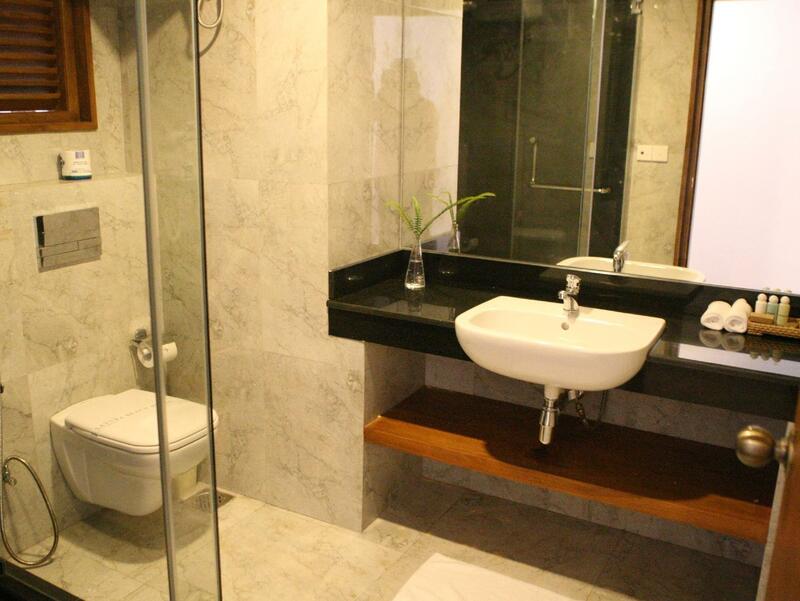 Cheap compared to other hotels of this standard in Sri Lanka. The staff are friendly. It's new so everything is very 'shiny' however there are a few kinks to iron out. Restaurant service is slow and complicated where it should be fast and easy. Food was just OK. Other things: In order for the air con to work, the balcony doors needed to be shut in a special way (which we couldn't work out) so we slept the night in a stuffy sweaty room at 2.30am we were able to go downstairs and find the night manager to close the doors for us and get the air turned on however immediately upon opening the doors in the morning we lost air con. And we were not able to close the doors properly to turn back on. Therefore the room remained a sweat box. They need to tell guests that the hot water needs to be turned on 5 minutes before showering as we couldn't figure out how to turn it on. Had to get dressed and go downstairs and ask for help. Note I say, go downstairs, as the telephone in the room does not dial reception. Σιδηροδρομικός Σταθμός Talpe στα 1.59 χλμ.